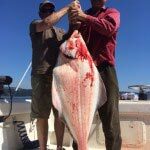 Bluefin Fishing Charters offer guided salmon fishing tours out of Sooke, B.C. Our fishing trips depart Jock’s Dock early in the morning. Following is a recollection of a day spent on the British Columbia waters from a husband and wife who were guests of Bluefin Fishing. It was definitely one of our most memorable fishing experiences, especially for my wife. Although the husband is quite the fisherman in his own right (fishing on the East Coast of Canada out of Ontario), he claims Pat was on another level for both knowledge and talent he had for teaching. When you take a guided salmon fishing trip with Bluefin Fishing Pat will spend the time to cover the basics with his guests. 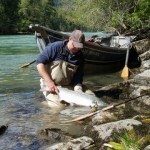 These often include; how to hold the rod correctly, the best technique for reeling in a large salmon, the finesse of the rod work used to coax a salmon into the boat, how to hook and land a salmon, how to properly turn a fish prior to netting it. By the time these techniques are covered the wife on this particular trip had already landed a 20 pound salmon on her line. Pat will teach you everything you need to know about salmon fishing while keeping you comfortable and relaxed the entire time. 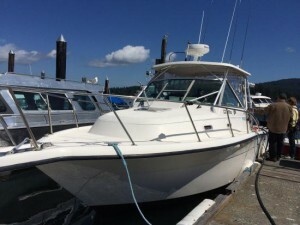 The Bluefin fishing boat is a 27 ft. Pursuit, guests are always impressed at how clean and safe it felts. Our guests are never pressured to fish, if your fishing partner wants to suntan — no problem, Pat will just kept the salmon coming. Bluefin Fishing Charters have all the up-to-date gadgets to locate the big fish, so you might never put your fishing rod down! There can however, be some lags and time to relax between catching fish. During these rare moments your salmon fishing guide Pat Williams will keep you entertained with his sense of humour and witty stories. 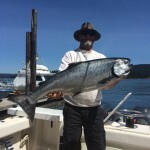 Even if it’s your first time out salmon fishing on waters of British Columbia, Pat will aim to limit out our catch, targetting four different types of salmon (depending on the season), and he loves to haul in salmon weighing in over 30 lbs! If you’re keen to take a fishing trip but feeling a little hesitant as it will be your first time fishing for salmon, you can be assured that Bluefin Fishing Charters come high recommended. Don’t take our word for it, take a look at the many positive reviews left on the Bluefin Fishing TripAdvisor page. Never being bananas on the boat with Pat . . . he says they’re bad luck!